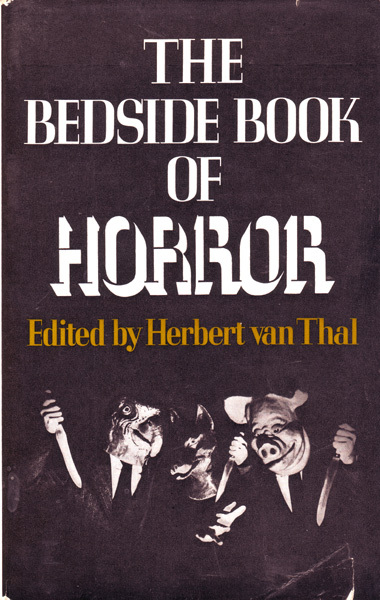 Herbert Van Thal - Bedside Book Of Horror | Vault Of Evil: Brit Horror Pulp Plus! Here's Herbert's short but sweet Foreword in its entirety. A critic recently observed that he failed to understand why authors wrote horror stories, and was equally censorious as to why anyone bothered to read them; yet the reason is fairly obvious. They are read principally because most of us find evil a more intriguing quality in human beings than goodness and virtue: witness the fact that disaster headlines undoubtedly sell newspapers. Whether it be in print, at the theatre or in the cinema, there has always been a taste for 'frightening escapism'. Moreover the cult of horror is hardly an innovation and we need but turn to the Greek tragedians, the Jacobean dramatists, even Shakespeare himself for proof. Can we watch without horror Macbeth, when the shape of the murdered Banquo usurps his seat at the banquet? Or are we not chilled at the incantations of the witches on their blasted heath? What of the banquet scene in Titus Andronicus? Are we impassioned spectators at the blinding of Gloucester in King Lear? Thus we could continue. Nor are the succeeding centuries without their considerable lumi­naries of horror – or can one with impunity dismiss Poe, Mrs Radcliffe, Coleridge, Mrs Shelley, Sheridan Le Fanu and Hoffmann as of no account? Still nearer contemporary times we pay homage to that great master M. R. James. But if we go on mentioning names such a catalogue will out-lengthen Leoporella's list of ladies, for few great authors have never essayed a horror story. The present anthology (and there is quite a library of such literature) I have divided into two parts: first I have reprinted what I trust are three little-known masterpieces, and in the second half I have included modern stories by acknowledged masters as well as two hitherto unpublished stories which also show considerable quality. Each of these confirms, even to the most disparaging of critics, I believe, that writing in the horror genre is an art in itself. David Dixon - The Recluse: Arthur P. Stanley, an aging hippie who has somehow convinced himself that he's a talented artist, is shunned by the locals who view him as, at best, a pitiable filthy tramp neglected by a domineering wife, at worst "Jack the Ripper reincarnated" as no-one has seen said Mrs. Stanley around for aeon's. People gawp up at his window while they wait for the bus, but he always yells at them to "piss off!" and they invariably do. But he doesn't really care, because his house talks to him. It may nag and fret over everything but he's OK with that, just so long as he gets to splosh his oils on canvas. But things get out of hand when he gets artist's block and starts having ideas. Perhaps he should get the Alice Wittaker Gallery to exhibit his work, then he'd make a fortune and it wouldn't matter if he never painted another masterpiece! Trouble is, as he soon learns when the horrified gallery rep pays a visit: "Nobody appreciates my work. Maybe I should cut my ear off and send it to Raquel Welch". Or perhaps he should kill the "great big fairy" for not recognising his genius. Not to give everything away but Arthur is a truly memorable psycho. There's none of this Norman Bates "insane cunning" about him, his every violent act is a direct consequence of the bad move that preceded it. The story is pitch black comedy but Arthur is so barking as to somehow convince and his murders are all the more horrifying for their spontaneity. Who was/ is David Dixon, then? The only other story I can find of his is a marvellously creepy thing called The Lodger In Room 16 (Fontana Horror #15). Fielden Hughes - Memoirs Of An Executioner: Felixstowe. A humble village cobbler moonlights as the public executioner and he's very happy in his work. We follow his progress from school (where he distinguished himself as a snitch) through his dual-apprenticeships, his most memorable hangings and, finally, after the abolition of capital punishment, as an isolated loner whose only companions are the ghosts of the two clients he found it within himself to pity. Despite the ghoulish subject matter, it's not especially horrific although there's something undeniably queasy about a fellow who gets a sexual kick from administering "justice".